James Joyce, Original Etching, 2015, 13 x 10 in. Signed and Numbered 11/ 35. 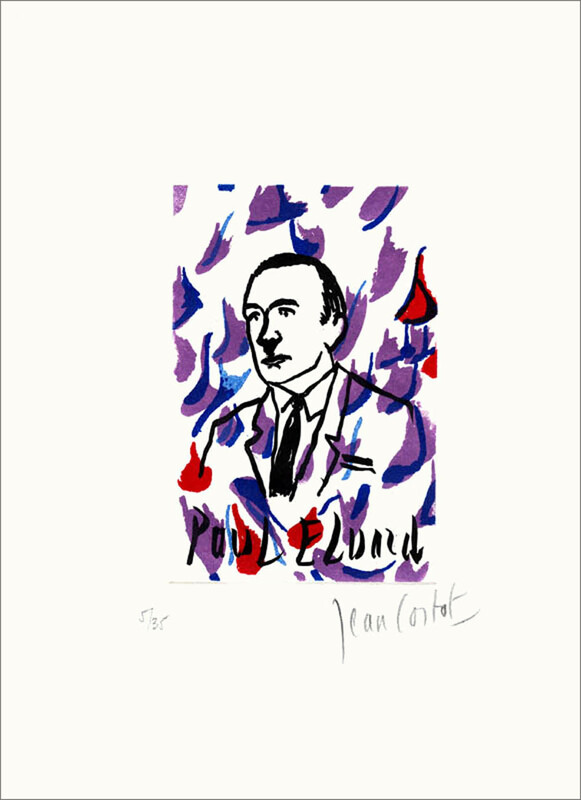 Jean Cortot is a French painter, poet and member of the Academy of Fine Arts, known for his inclusion of text and poetry, as well as dashing colors in his work. Cortot was born in 1925 in Alexandria, Egypt. He studied under Othon Friesz at le Grand Cahumière in Paris. In 1948 he won the Prize of the Young Painter, followed by the Prize of the Mediterranean Union for Modern Art in Menton in 1954. Cortot is often known for graphic art, having illustrated numerous novels, thus aiding him to realize the connetion between painting and writing. His taste for letters and and philosophy led him to illustrate more and more literary works edited by Maeght Editeur, including works by the poets Jean Tardieu, Louise Labé and many others. Close to countless poets, he transposes text, hommages and portraits on cavas and on paper. The Galerie Maeght in Paris has regularly exhibited his lithographs, illustrated texts and paintings. Cortot was elected member of the Academy of Fine Arts in 2001 taking the seat of Olivier Debré.